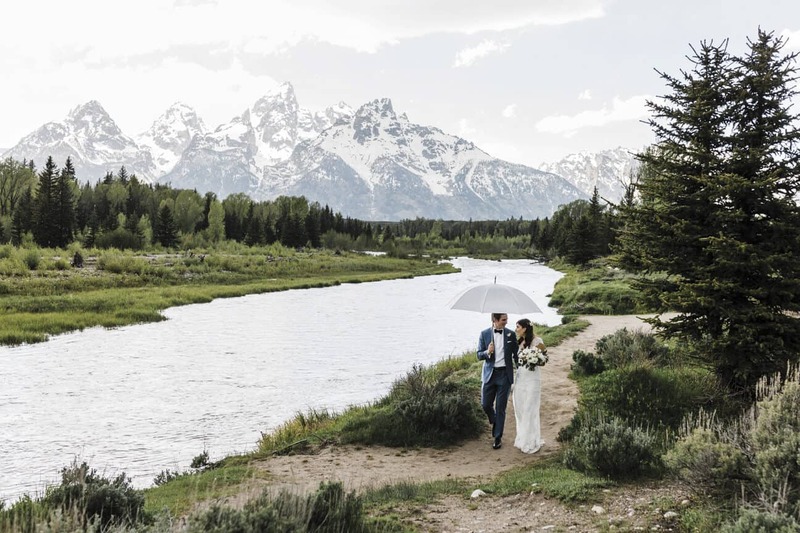 While hosting a Teton wedding guarantees a beautiful backdrop, it also promises unpredictable weather. We can have snowstorms in July, sun-drenched days in May, windy weather in August, and mild temperatures in mid-November. Additionally, the region’s wilderness is susceptible to wildfires, and subsequent smoke and haze can compromise the Teton air quality. 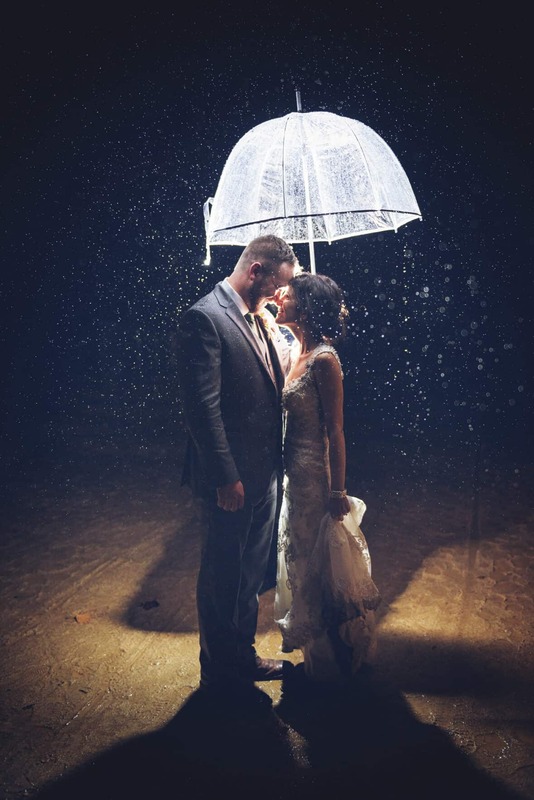 As you select your venue and set your date, consider ways to keep your guests comfortable—no matter what Mother Nature throws your way. When the sun is high in the sky and the days are long, the valleys on either side of the Tetons get their share of warm summer days. To provide some shade for your guests, consider using sunshade sails (fabric with UV block) or fancy umbrellas. Be sure to strategically place the shade sails and umbrellas throughout your ceremony location at a height that avoids any issues with blocking guests’ views. If shades aren’t practical for your decor or theme, consider providing individual, hand-held fans. Guests can use them to make a little cool breeze or to block the sun. 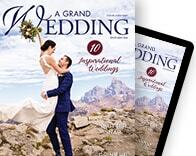 Following your ceremony, offer your guests chilled towels and a refreshing beverage—like a glass of huckleberry lemonade or a signature cocktail on ice—to quench their thirst. Be sure to keep the water flowing: Sugary or alcoholic beverages are more dehydrating than hydrating. Warm weather attracts insects, and if you’re near water it may mean bothersome bugs like mosquitoes. Consider hiring a professional to spray for mosquitoes before your celebration or provide bug spray for your guests. If wildfire smoke is an issue at the time of your wedding, advise your guests in advance and take extra steps to keep everyone comfortable. Most healthy people will recover quickly when exposed to smoke, but people who have heart or lung diseases can really suffer. The elderly, young children, and pregnant women should avoid exposure. Check local air-quality reports and forecasts, and have a “plan B” outlined in case you need to move your outdoor wedding inside. Cool and cold weather are inherent to mountain living. In the summer months, evenings cool down and people often require a jacket for comfort. 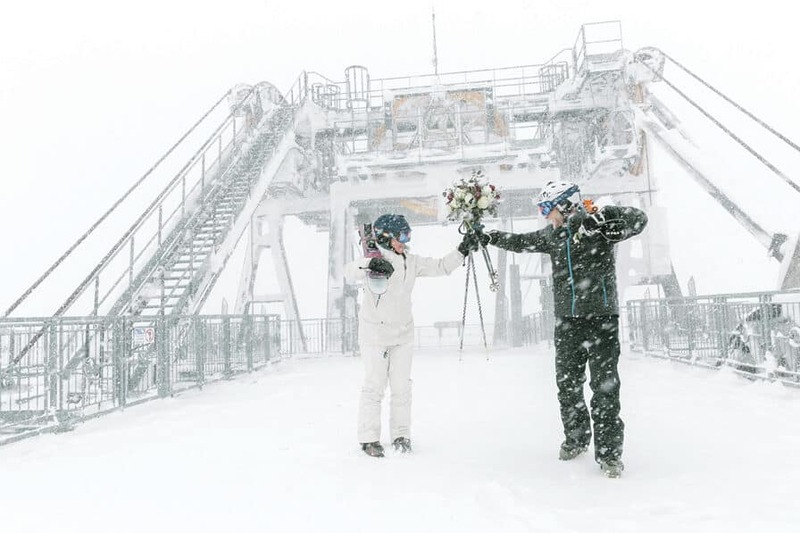 Winter months bring cold temperatures, frequently in the single digits, and tons of snow. To keep your guests warm when temperatures turn cool or cold, provide a basket of blankets, scarves, hats, and mittens. Offer individual hand warmers for extra-cozy hands! Invest in a tent made of thick, sturdy fabric. Not all tents are created equal. Make sure yours has adequate sides, which you’ll want to close early to trap heat. Check with your rental company to make sure you can use candles and heaters inside your tent. Fire up some propane heaters to take away the evening’s cool edge. Rental companies stock varying sizes and models, depending on your space and heating needs. If you have a fire pit, lighting a fire is always a crowd-pleaser. Guests can stay toasty in front of the fire while sipping beverages like hot cocoa, apple cider, or even a hot toddy. At high altitude, the sun’s effects, good and bad, are magnified. According to Jeffrey Benabio, MD, FAAD (thedermblog.com), at 6,000 to 8,000 feet in elevation, you are exposed to 25 percent more ultraviolet radiation than at sea level. Add snow reflection to the equation and you have 80 to 90 percent more UV light reflecting at you (compared to 3 percent reflection on grassy areas). To offset the sun’s intensity, offer your guests plenty of water. Staying hydrated in the Tetons’ dry climate is critical to staving off many ailments—from dry, cracked skin to headaches or altitude sickness. And while your guests may love the extra vitamin D, don’t forget to provide a variety of sunscreen products for body, face, and lips. In Jackson, where the base elevation is 6,237 feet, it can take less than twenty minutes for skin to redden.